Trevon Trammell runs for yardage Friday night. He accounted for 5 Clear Fork touchdowns in the 54-14 win at Ontario. 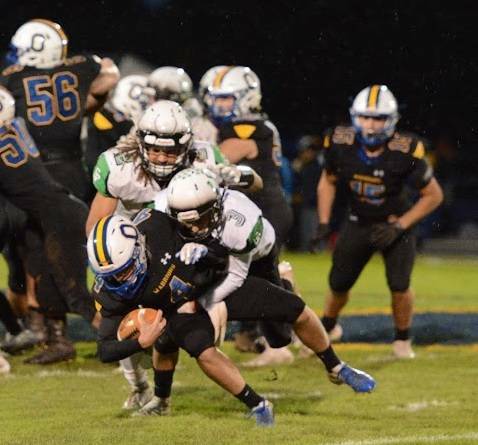 Clear Fork defenders swallow up an Ontario runner Friday night in the Colts’ win on the road. 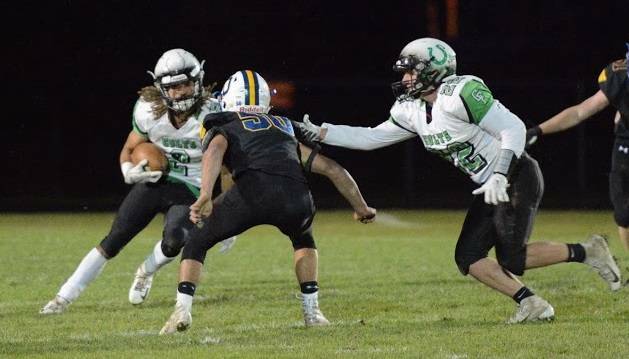 Gabe Blauser tackles an Ontario ball carrier Friday night. The 54-14 win at Ontario gave head coach Dave Carroll his 200th career coaching win. ONTARIO — The Colts won their 8th game of the season Friday night, topping Ontario 54-14 and setting the stage for this week’s big rematch against MOAC rival Pleasant. It was also coach Dave Carroll’s 200th career win. 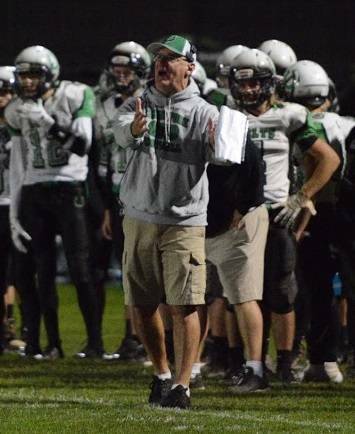 The victory keeps Clear Fork, ranked seventh among the state’s Division IV schools, perfect at 8-0 overall and 5-0 in the Mid-Ohio Athletic Conference. Ontario slipped to 3-5 and 1-4. What the win also means is a rematch with a team it beat last year on the road in a thrilling finish. Trevon Trammell again enjoyed a fine outing, reaching the end zone 5 times. He rushed for 147 yards and three touchdowns on 9 carries. He also caught 4 passes for 94 yards and 2 more scores. But he had plenty of help from his teammates. Junior quarterback Brennan South completed 7-of-11 passes for 131 yards and a TD. He also ran for a score. His counterpart signal-caller Jared Schaefer connected on 3-of-7 passes for 65 yards and a score. A.J. Blubaugh had 3 catches for 53 yards. Senior Caden Flynn returned the game’s opening kick off 90 yards for a TD. Senior Zach Homerick ran for a score from 5 yards out. 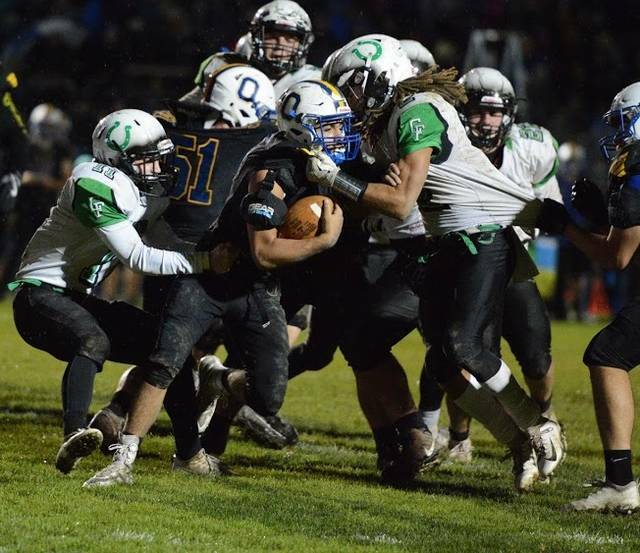 Clear Fork rushed for 202 yards on 22 carries and passed for 196 more. Ontario scored on a 5-yard run from Creed in the first quarter and an 83-yard pass with 58 seconds remaining in the game. The Warriors were held to 61 net rushing yards and 126 through the air. Flynn and Michael Chillemi recorded sacks. Chillemi had 10 tackles and Brady Tedrow 6. SEASON STATS: Through 8 games Chillemi has 41 tackles and 4 sacks; Tedrow 34 and Schaefer 30. Trammell has 815 rushing yards and 15 touchdowns for the season. Schaefer has thrown for 773 yards and South 801, the two combining for 17 TD tosses. NEXT: Pleasant defeated Marion County rival River Valley 42-0 to enter this week’s contest at 7-1. The lone loss came against Buckeye Valley. The game kicks off at 7 p.m at the Colt Corral. https://www.thebellvillestar.com/wp-content/uploads/sites/39/2018/10/web1_trammell.jpgTrevon Trammell runs for yardage Friday night. He accounted for 5 Clear Fork touchdowns in the 54-14 win at Ontario. https://www.thebellvillestar.com/wp-content/uploads/sites/39/2018/10/web1_hand-to-hand-combat.jpgClear Fork defenders swallow up an Ontario runner Friday night in the Colts’ win on the road. https://www.thebellvillestar.com/wp-content/uploads/sites/39/2018/10/web1_No-room-to-run.jpgGabe Blauser tackles an Ontario ball carrier Friday night. https://www.thebellvillestar.com/wp-content/uploads/sites/39/2018/10/web1_Carroll-200th-win.jpgThe 54-14 win at Ontario gave head coach Dave Carroll his 200th career coaching win.